Sophisticated and stylish, Lake Como is unique amongst Italian lakes, yet you’d be surprised how inexpensive a holiday here can be. Fantastic mountain scenery, amazing panoramas, exquisite lakeside towns and villages will all make your Lake Como holiday an unforgettable experience. The Lake Como offers interesting holiday offers with personal advice in quality-tested, well-kept holiday houses, apartments and villas for every taste. Let us advise you personally. For your family, sports & culture holiday we will be happy to give you tips. Lake Como is located in the Lombardy region of northern Italy in the Southern Alps. In Italy it is called Lago di Como, but many will just refer to it as Lario, a reference to its Roman-Latin name Larius Lacus. 51 kilometres in length and 4.2 kilometres wide, Lake Como has an area of 146 square kilometres (56 square miles), making it the third largest lake in Italy after Lake Garda and Lake Maggiore. At over 400 metres (1,300 feet) deep, it is one of the deepest lakes in Europe and the bottom of the lake is more than 200 metres (660 ft) below sea level. Lake Como’s weather is generally mild and the area is known for its Mediterranean climate where sub-tropical plants can grow all the year round. Average daily temperatures range from about 2 °C (36 °F) in January to 30 °C (86 °F) in July and in winter the lake helps to maintain a higher temperature in the surrounding region. Water temperatures can reach an average of 24 °C (75 °F) during the month of July. Snowfall is erratic and primarily affects the higher elevations. Lake Como nestles in the steep slopes of the Southern Alps and is surrounded by dramatic mountain scenery (Lake Como Map). 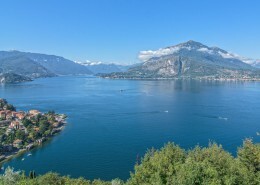 The lake is fed by a total of 37 tributaries, the most important of which, the river Adda, enters the lake at Colico in the north and flows out in Lecco at its southern-most tip. At 2609 metres, Monte Legnone is the highest mountain on Lake Como. West To the west, the most popular destinations are Argegno, Brienno, Cadenabbia, Carate Urio, Cernobbio, Colono, Cremia, Domaso, Dongo, Gera Lario, Gravedona, Griante, Laglio, Lenno, Menaggio, Mezzegra, Moltrasio, Musso, Ossuccio, Pianello del Lario, Rezzonico, San Siro, Sant ‘Abbondio, Sorico, Tremezzo, Trezzone, Vercana and the only island of Lake Como, Sala Comacina. South To the south stretching from Como, the capital of the province of Como, westwards to Bellagio and over to Lecco, the capital of the eponymous province in the east, you will find many other interesting towns and villages including Blevio, Brunate, Careno, Civenna, Faggeto Lario, Lezzeno, Limonta, Malgrate, Molina, Nesso, Oliveto Lario, Onno, Perlasca, Pognana Lario, Torno, Valmedrera and Vassena. East The eastern shore of Lake Como, which is less built-up but with great access to motorway and railway links, includes the towns of Abbadia Lariana, Bellano, Colico, Corenno Plinio, Dervio, Dorio, Fiumelatte, Lecco, Lierna, Mandello del Lario, Olcio and Varenna. Lake Como’s distinctive upturned Y shape conveniently divides the lake into three main regions: the west bank, the eastern shore and the southern shore, making a total distance around the lake of 170 kilometres. The lake’s shores are surrounded by dozens of charming towns and villages. The many visitors who return year after year to Lake Como marvel at the way it manages to retain its traditional Italian charm. An important factor in this is the number of fabulous historic villas and beautifully maintained gardens which can be found dotted around the lake. 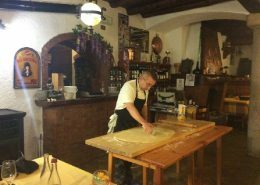 These were built at a time when the region around Como in particular benefited from the emergence of the silk industry and many date back as far as the 15th century. 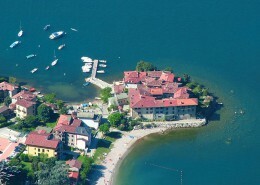 Some are still inhabited today or open to the general public, such as Villa La Collina, former summer residence of German Chancellor, Konrad Adenauer, now used as a conference centre or the splendid Villa Serbelloni in Bellagio, preserved as an elegant 5-star hotel with all the luxurious standards of yesteryear. As a holiday destination, Lake Como offers a varied menu of sporting activities as well as fun and games. In particular, conditions are ideal for water and mountain sports making it the perfect place for active holidaymakers. Experience sailing, kite surfing, surfing, wakeboarding, water-skiing, rowing, canoeing, diving, motor boating or fishing in beautiful surrounds and discover the most scenic routes up in the mountains whilst hiking, mountaineering, climbing, biking and horseback riding or just relax playing golf, tennis or the local game of bocce, whilst enjoying splendid lakeside panoramas. Whatever your passion, there’s something for everyone!